Not too long ago, I was searching online for cute skirt and dress patterns for my 3 year old, Avery. 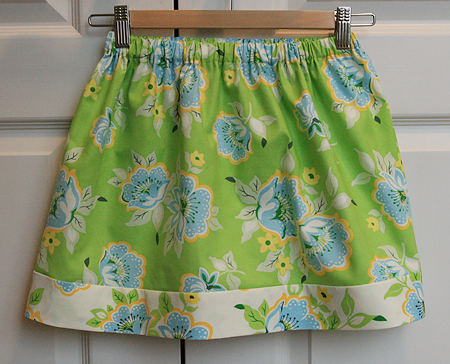 I stumbled upon a fairly easy looking FREE skirt pattern at Oliver + S. If you have any little girl (or boy) to sew for, you must check them out. They have the most darling things. Anyway, I couldn't pass up something free! So I printed it out and it sat in a pile of patterns at my sewing table. Today my kids spent the morning at the grandparents house so I had a glorious 4 hours to do whatever I wanted. Unfortunately, most of it was spent grocery shopping at Target and Trader Joe's. Well afterwards I had enough time to hit up my local fabric stores! I finally was able to see Heather Bailey's new line, Nicey Jane. It is so cute!! I bought a bit of it, some FQs for a future quilt and a couple yards for a dress for Avery and the free skirt pattern I had downloaded. 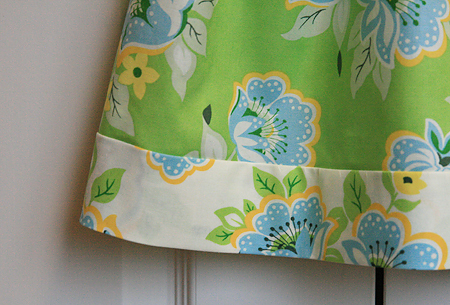 After the kids got home and went down for their nap, I decided to try making the skirt. It was SO easy. Seriously, it took me under an hour and less than 3/4 a yard of fabric (1/2 yard of the green and 1/4 yard of the white.) I changed the pattern slightly by using a coordinating fabric on the bottom, rather than a ribbon. I plan on making many more of these, hopefully Avery likes it as much as I do. Here's the finished product!